It is the nature of poetry and poetry-as-song that it wants to travel further afield than just around the corner. It has never been content to stay at home talking to itself. And it is the nature of the poem itself that it wants to arrive somewhere. ‘Poetry is not a bird looking for a cage,’ as a poet said recently at the fifth World Poetry Festival in Craiova, Romania, my second visit and invitation as a New Zealand poet. This desire for poets and poetry to cross frontiers, political and cultural, and to raise its voice to ‘shine a light in the world’s ear’ is at heart the raison d’etre of this Romanian Festival. A celebration of poetry and prose-poetry; and what poetry can make happen when a cantata of multi-cultural voices makes up the choir. ‘Can you imagine waking up to a world in which there is no poetry?’ I asked at a reading we gave to the cadets at the Craiova National Military Academy. A small silence and some discreet foot shuffling—until the ever-alert presiding Colonel, suitably festooned with braid, signed the signal, and the cadets in a body rose to attention and snapped off a perfectly drilled salute. A surprising ‘lyric salute’, I thought. Followed by two of the cadets, a gender balance, reading back to us their own poems. A fanfare of enthusiasm, it was agreed by all an heroic occasion. And a couple of us snapped off (discreetly) one or two salutes of our own, just for practice, you never know. And then we had tea and photos. 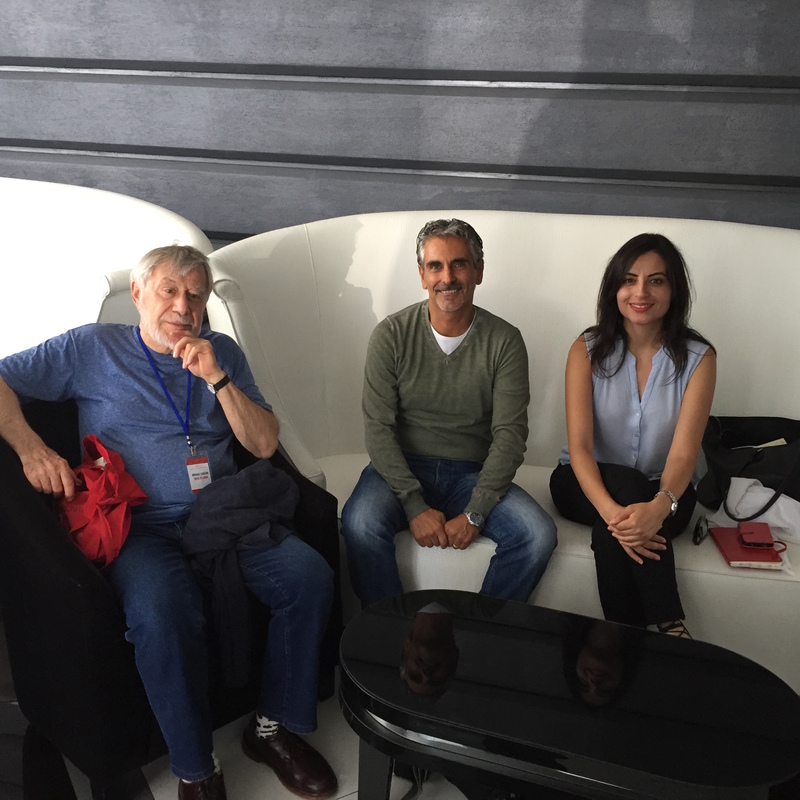 Michael Harlow (left) with poets from Italy and Turkey at the World Poetry Festival, Craiova. I’ve read in a prison in Nicaragua where at first it was not easy to distinguish the prisoners from the guards (this is a ‘democracy prison’, the Boss warden assured us); in a remote and small market town in Colombia accompanied by the local trombonist and his sousaphone friend who commanded the makeshift platform, double decibels with applause to match, and an encore … for the musicians; and an even more remote town on the border between Venezuela and Colombia, where three of us an Israeli, myself, and a poet from the Dominican Republic landed in a tom-thumb airplane, some 50 kms from where we were supposed to be (an ordinary navigational error it seems)—and where we were offered flak jackets, just in case, for a visit to the border for a tourist gawk if we wished, after our performance outside the local library that came to the rescue. And now, a Military Academy to add to the list—not quite a border crossing. 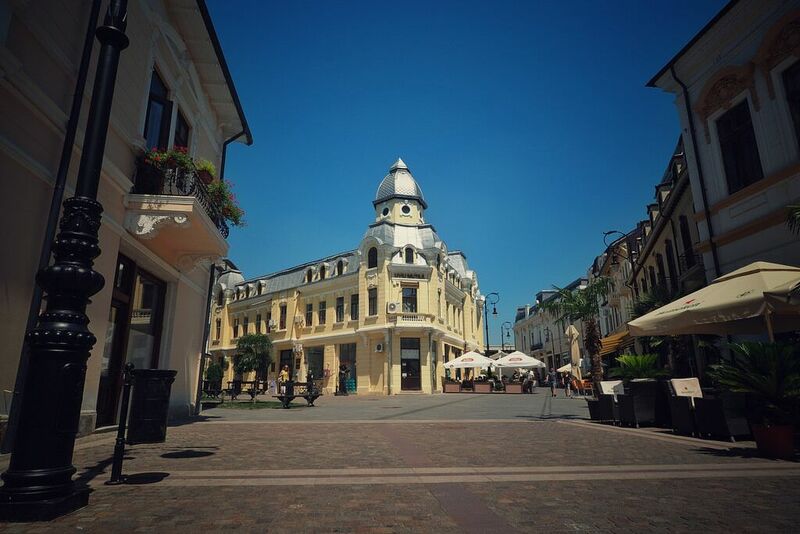 Thirty poets from thirty countries gathered in Craiova, a city clearly dedicated to ‘going for green’, rightfully proud of having the second largest urban park in all of Europe. We began by reading to the public from the stage of the ‘Romanescu Summer Theatre’, joined by one of Romania’s celebrated actresses, who with diva-like brio unstoppably rattled off English and Romanian translations of the work of our presenting poets – the air charged with fair-flying emoticons, the best ‘Performance’ of the day some enthusiasts (not all) declared. 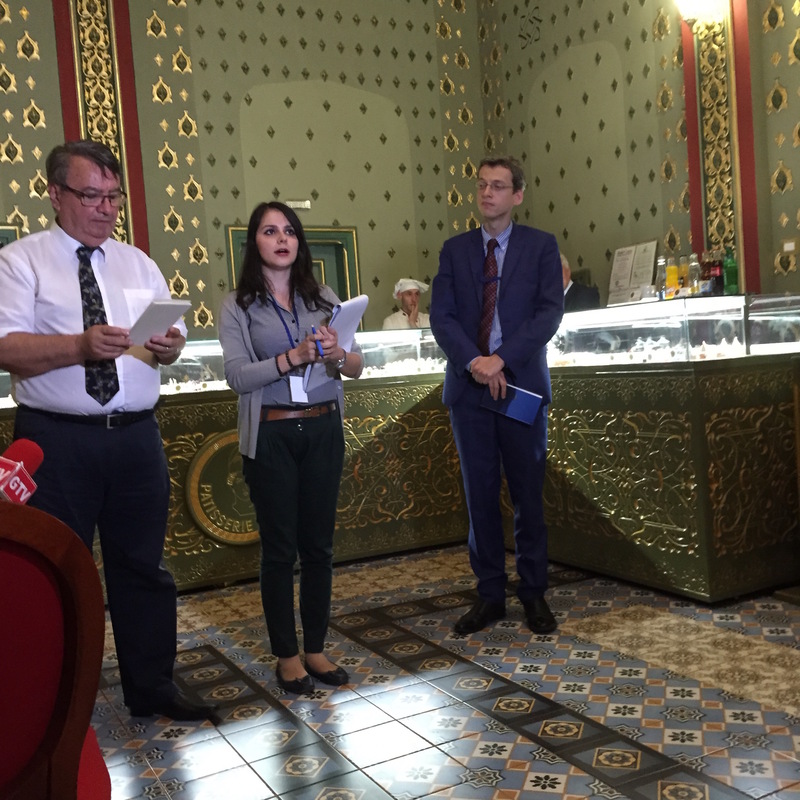 Poets reading at the Minerva Bakery, Craiova. Not to be outdone by the Minerva, the Marin Sorescu National Theatre pitched in with their special cultural contribution, Sad Poems and the Pontics, a solo dramatic performance of poems by Ovid in exile (accompanying English translation on a wide screen); a very polished and professional performance, this Poetry of Theatre, and very much in the spirit of this Craiovan Festival. 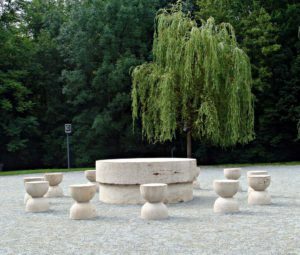 And this being very much Brancusi country, the Poetry of Sculpture on offer, there was a visit to the rural city of Targu-Jiu, a place that celebrates and memorialises the life and work of this patriarch of Modernism. To our surprise, at the local Museum-Art Library, there was a pictorial exhibition of all participating poets and translators: a series of character-caricature drawings displayed along the walls of the Gallery—drawn by a 10-year-old local budding artist. Concluding with a presentation of a book of these ‘portraits’ gifted to us individually as visiting poets to their city. Table of Silence at Targu-Jiu. Photo by CameliaTWU on Foter.com/CC BY-NC-ND. As one might expect, the political imagination and the political poem was very much on offer—in poems as a thoughtful undercurrent or direct declaration. Some pretty exciting and engaging poetry being spoken, almost always in the lyric mode, and (amen) almost always eschewing the bloated, misguided, and dismal ‘propaganda poem’. And lots of wit about too, and at times as much laughter as we could bear. And not only the political imagination being flexed, but the additional pleasure of the romantic imagination in flight. ‘To make a bird become an angel’ as the poet Memmed Ismayil from Azerbijan said on receiving one of the many awards presented during the Festival. Any number of poems by various poets affirming, in various ways, that poetry wants to take the imagination into the heart; and that poetry makes intimate everything that it touches. You could say one of the truths of the romantic imagination was very much on poetic display throughout the festival. And a treat, the appearance of a celebrated Romanian folk-singer. Definitely in the tradition of the troubador, who throughout the evening strolling up and down ‘made song’– a rather extraordinary vibrato performance. And as you might expect, to the musical accompaniment of the local DJ, an eruption of a miscellany of dance moves; and at one point a solo performance in the ‘whirling dervish’ tradition (mind you without the howling). A fine finale to a dedicated festival of poetry and the arts. Michael Harlow lives and works as a writer, editor, and Jungian therapist in Central Otago, Alexandra, New Zealand. His many accolades include the prestigious Lauris Edmond Memorial Award for Distinguished Contribution to New Zealand Poetry (2014).